In today’s fast paced world balancing work life with personal life is a daily struggle for most of us. It’s certainly not possible for all of us to have personal assistants to keep track of the different things we need to do everyday. Apps such as Evernote or Reminders certainly make life easier by allowing us to set up task notes and reminders. If you are someone who wears a contact lens that’s built for extended use, you have the additional burden of keeping track of its replacement schedule, getting prescriptions, placing orders and ensuring you get it on time. All this when you already have a zillion things to do! 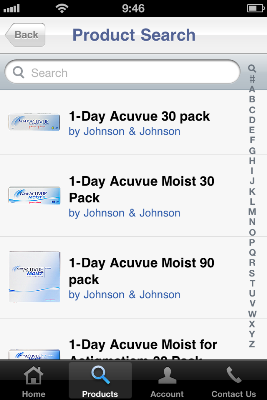 Luckily, 1-800 Contacts App saves you all that hassle. In this post we take a look at how the 1-800 Contacts app for iPhone lets you manage your all your contact lens needs from one place. What makes a free mobile app great is its user interface. If the app is isn’t impressive right away, chances are users will simply not bother with what the app can offer. 1-800 Contacts has been designed keeping this in mind. 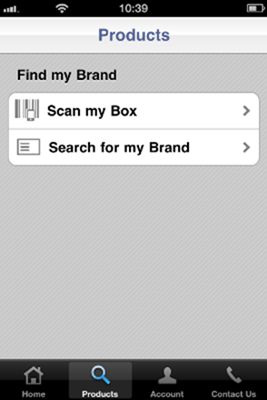 Open up the app and right away, you have access to everything you need to get shopping. 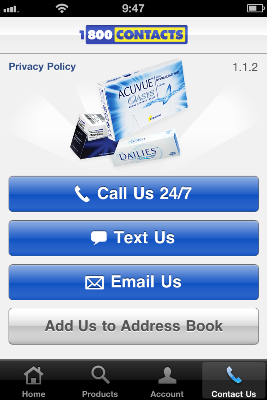 If you are a 1-800 Contacts customer, you can simply sign in to your account to place your orders. 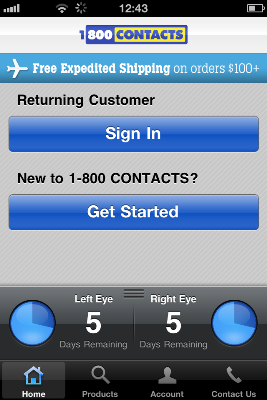 If you are a new to 1-800 Contacts, you can click the Get Started button to set up your account and place orders. If you are not a 1-800 Contacts customer, you can still use the LensGauge feature on the Home screen to set your contact lens replacement reminders. And all this involves only a few clicks or less! The 1-800 Contacts UI also displays quick links to check your contact lens brand, track your orders and connect to customer services. That’s all the information you’ll need to ordering your lens and its all available right there on the Home screen itself. 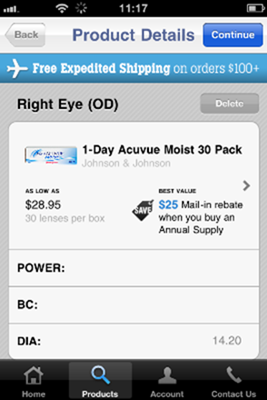 Another excellent feature of 1-800 Contacts is Scan my Box, with its built-in scanner that lets you upload your prescriptions without having to type in anything at all. Or, you can upload a picture of your paper subscription to enable faster processing and shipping. If you’re a terribly busy person, you know what a big time saver that is! If you are a returning customer, you can log in right away to place your orders. If you are a new customer, you will be guided through a series of steps to set up your account. First, you’ll need to select your brand of lens, enter the prescription details such as the Power, BC, and such, then add the name of the patient or user buying the lens (you can add more than one user or patient), finally you’ll need to take a picture of the prescription for verification purposes and find a doctor using GPS or from your address book. All this should take up to 5 minutes or less, if you’ve got your prescription at hand. 1-800 Contacts brings a level of credibility to accepting orders as you cannot simply place them without a proper prescription. Payments can be made quickly by scanning your credit card or using Paypal. The app has an impressive catalog featuring top brands including Acuvue, Biofinity, Biomedics, Focus, ExtremeH2O, and PureVision, just to name a few. Plus there are a variety of materials to choose from. Worried about tracking your orders? You can simply tap the Account button to check the status of all your orders. The app also offers expedited delivery for bulk orders placed, so that’s something worth considering as well. As with all services, there may be times when things may go awry and you’ll need to contact customer services. The app offers quick links to call, text or email the department, and also promises quick response for queries made. One feature I’d love to see included in the app is alerts to ping you when you need to change your lens. Although the app features a reminder on the Home screen itself, you may have to go to the app each time manually to check the dates. Alerts would be a good improvement! 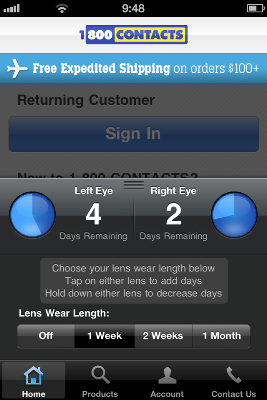 I love the fact that even non 1-800 Contacts customers can keep track of replacement dates using LensGauge. That’s a simple free service yet, it offers great value to anyone who uses the app. Plus there are no ads pushing sales in your face. Nice! 1-800 Contacts is a useful app designed for the modern user looking to get things done quickly and efficiently. The app is not stuffed with too many features, yet the ones that it has ensures that life in one aspect at least, is made that much easier. If you want to save yourself the hassle of running to the medical store every time you need to replace your lens, consider using 1-800 Contacts. You can download it at iTunes and find more information on their website.